Latisha waits for a direct message from her hookup through Instagram. She gets the details of where and when the next day’s “sister session” – an underground wholesale marijuana market – will take place. A few meetups are held around the Valley each month. Attendees bring a dish, socialize and shop – like a Tupperware party, but for weed. To prevent police “busts,” locations aren’t repeated. These sister sessions are an offshoot of California’s Sister Seshes, created by the organizers of the Glowing Goddess Getaway, an all-inclusive, female-only retreat with a similar marijuana buffet concept. 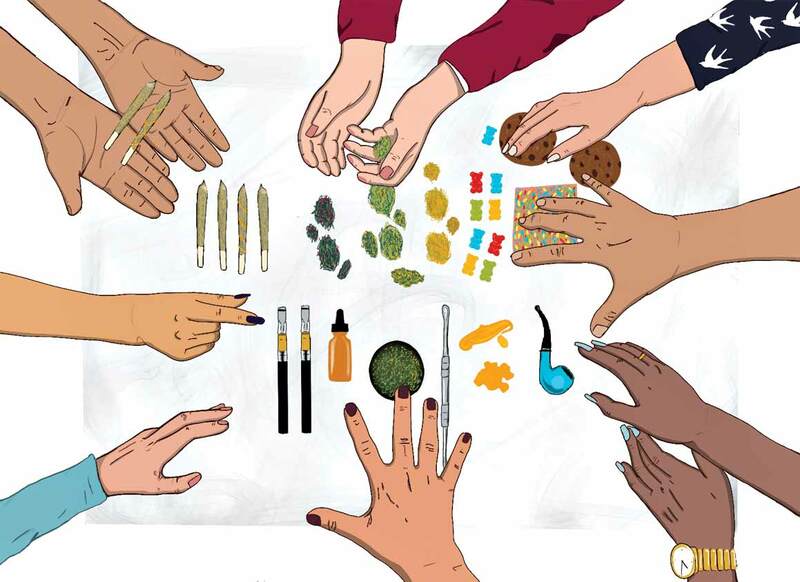 They show the changing demographics of the industry – female, upwardly mobile – and how users are navigating the legal labyrinth of pot. Latisha (real name withheld), used to go the legal route, obtaining a medical card for her anxiety and insomnia. She eventually went underground to legally pursue another pastime: hunting. Federal law maintains that marijuana users are prohibited from owning firearms. This Catch-22 is one reason the underground market is doing so well. Restrictions on the amount of legally obtained marijuana is also a sticky point. “Some people reach an allotment with their medical marijuana card [Arizona limits users to 5 ounces per month],” Latisha says. One ounce makes roughly 80 joints. It’s a substantial amount, but if a handful of friends ask for handouts, it quickly depletes. Avid marijuana users can make their way through it in a week or less. Because the marijuana industry is primarily run by men, women get a discount on sister sessions cover charges ($5, compared to $10 for men) and can bring a vouched-for plus one. Consequently, sister sessions are female-centric. At the session Latisha hosts on a sunny Sunday in Mesa, a marijuana buffet overflows with THC-packed products. Barbecue sauce, hummus, crispy rice treats, gummy candies and more fill one table. Another displays dabs: concentrated forms of sticky, wax-like cannabis that are smoked through a glass water pipe. Strains of premium marijuana – according to Phoenix dispensary Nirvana Center, a top-shelf, Arizona-grown hybrid blend called Valley OG retails for $220 an ounce – are displayed. “I just want to chew on that,” Latisha says. California transplant Deidra Bagdasarian is a co-founder of the Glowing Goddess Getaway. While she supports legalization, Bagdasarian is concerned about the adverse effects it’s had on marijuana farmers in California. “Farmers are now making the least amount per pound because of taxes in California since [legalization],” she says between bong rips. Consumers have felt the monetary squeeze, too. Medical marijuana card holder Meredith Simon says the overall cost to obtain a card is around $250-$300. The solution for many penny-pinching “ganja goddesses” seems to be sister sessions.